When Ed Marx got a call a few years ago about a position in New York City, he knew right away it was a winner. Not only because of the opportunity it offered to lead an Epic implementation and provide much-needed leadership, but because he had long had his sights set on the Big Apple for personal reasons. In this interview, Marx opens up about what he loves most about his role as interim CIO, what Larry King taught him about building relationships, and the key qualities he looks for in future leaders. He also gives his thoughts on work-life balance, and why everyone should have a mentor. There are a lot of really good, very well-intentioned people, and the opportunity to come in and help with the development of leadership that will last long after I leave, that’s very rewarding. I was a wallflower, but I knew that success really was predicated upon the ability to develop relationships both quickly and deeply. If I try things on my own, I’d be pretty mediocre, but by extending my capabilities through others and by leveraging the things that they’ve learned, I make myself a lot stronger, and therefore, I provide a higher level of service for those who I work for. You’re going to make mistakes. If you have a good relationship with someone, they’re going to be pretty quick to forgive you and realize that, yes, you made a mistake, but that’s not who you are. Stop using email or hiding behind a phone, and be there. When there’s a difficult situation, it’s really important that you go there in person and they see you, because that speaks of volumes. Gamble: Thank you, Ed, for taking some time to speak today. Marx: My pleasure. Thanks for having me. Gamble: Sure. Now, in your current role, you’re part of the IT leadership team for New York City Health and Hospitals and that’s through the Advisory Board Company? Marx: Correct. 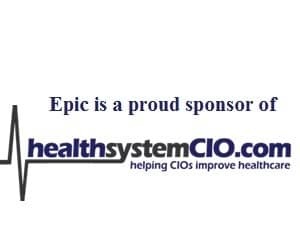 I am the executive vice president of Advisory Board, and my 100 percent-focused assignment is to help with IT leadership for the City of New York Health and Hospitals Corporation. Gamble: That’s a pretty big system. Marx: Yeah. I’m not sure people realize this, but it’s the second largest public health system in the world, and the largest in the United States. Gamble: We spoke a little while ago with Kathryn Crous, who is with Kings County Hospital, which is part of NYC H+H. She referred to you as a CIO consultant. Is that an accurate description of your role there? Marx: It’s complicated as most things can be in a large public health system. I am definitely a consultant. The title I’m given is Interim CIO. My specific focus is to help make sure they’re successful with implementing electronic health records. Gamble: What do you enjoy most about that role? Marx: I enjoy making a difference. We all want to live a life of significance and leave our mark in helping others and serving others. Being in the public healthcare sector for the first time in my career is very, very rewarding. I’ve worked in for-profit health systems. I’ve worked in community hospitals. I’ve worked in academic medical centers. I’ve worked in standalone hospitals. I’ve served in large integrated health delivery systems, but this is my first time in public health. There are a lot of unique rewards that come along with that, and that’s one of the things that I enjoy. The other thing is the city itself is just an amazing, perhaps in everyone’s top three list of the best cities in the world and I love being part of it. Right now I’m in front of City Hall, standing outside in a park and just looking around me, and I’m still in awe, even after two years, of the opportunities. There are so many reasons. The third is helping to develop leaders here. There are a lot of really good, very well-intentioned people, and the opportunity to come in and help with the development of leadership that will last long after I leave, that’s very rewarding as well. Gamble: Being a public health system, the executives report to the mayor of New York? Marx: The way it works is the president/CEO of New York City Health and Hospitals reports to the deputy mayor of Health and Human Services, who then reports to the mayor. That’s the lineage. And there are a couple of other deputy mayors that have the health and welfare of the citizens of New York City very near and dear to their agenda as well, and there are others involved, but that’s the direct line. Gamble: Interesting. So you’re happy being in New York, which of course is a big change from Texas. Was it a difficult choice or did you know you wanted to experience New York? Marx: It was very intentional. I received a notification from an executive in the healthcare IT community that said, ‘We really need your help in New York City.’ I was pretty happy and satisfied with everything going on in Texas, but I did have a special connection to New York City. The short version of the story is that my dad is one of the oldest living holocaust escapees. When he escaped the concentration camp in World War II after a journey through the mountains and into Switzerland, he ended up coming to New York City via the Red Cross — this was after the war. My dad always wanted to go back to the city because the city adopted him. He really had no one. And then a couple of years later, my dad turned 18 and he was drafted in the American Army, and they sent him back to Europe. My dad had a very long, storied civil servant career and military career, but never got the chance to come back to New York. So when I heard about this role, it was a no-brainer. I investigated it, then I called my dad and said, ‘Dad, I get to fulfill the promise you made to the city on your behalf.’ That’s the short version of a longer story, but it’s why I jumped at the chance to come here and be part of this. Gamble: Wow, that’s fascinating. It’s a city where if you do it right, you can really take advantage and be able to expose yourself to so many different experiences. Marx: It’s just a fantastic city. We’ve definitely taken advantage of the arts that are here, whether it’s the museums or Broadway or live jazz. We work very, very hard. It’s the most complex service that I’ve ever been involved with, so it’s really important that we also balance ourselves and take the time to enjoy the environment as well. We’ll stay over on weekends and we’ll stay here for holidays. We’ve really made the most of it, and I insist on the same with my team. We do a lot of team-based activities after hours or on weekends and really take advantage of this opportunity to not only serve the citizens of New York, but also to take a little bit of time out for ourselves. Gamble: That lends itself to another topic I wanted to discuss, which is building strong relationships. Any advice you can give on what it takes to do that, especially for people who are more on the shy or introverted side, on how to really get those relationships going? Marx: I think I learned a lot from listening to a seminar once [with Larry King] and it was specifically about your question. He said, ‘People love to talk about themselves. What you need to do is ask them questions, and the rest will take care of itself.’ Because I was a wallflower, but I knew that success really was predicated upon the ability to develop relationships both quickly and deeply. So I started doing that. I started showing genuine interest in people and I always had a list of prepared questions. You just ask people about themselves, about where they grew up, about where they live, about things they like to do, and people will naturally take over, and then you hear things that you have in common. For instance, let’s say you’re talking about Broadway shows, and someone says, ‘Wow, my spouse and I like to go to Broadway shows.’ So you say, ‘which one ones do you recommend?’ If you ask three or four questions, you’re usually going to find enough commonality where you can start developing a relationship, and ultimately, a friendship. I just always come loaded with tons of questions — more about personal life and not so much about the business side, because the business things come later. You have to establish that relationship in order for people to open up to you about the business. Gamble: Right. As someone who is in the CIO world, as so much experience in the CIO world, you guys are really in a pretty unique, I don’t want to say organization, but it’s a pretty unique group where it seems that there’s a lot of examples of people who reach out to each other to offer support, even if they’re at a different organizations. I remember talking to Rick Allen, who told me he reached out to you when Texas Health was going through a rough patch, and let you know that you had support. I’m sure something like that really means a lot. Marx: Absolutely, there’s definitely a tight-knit community. I think it was Zig Ziglar who said you can get anything you want if you give everyone what they want.’ I’m paraphrasing a little bit, but and he was absolutely right about that. Whenever someone reaches out, I always get back to them — especially other CIOs, because, one, I want them to be successful. I love to share what I’ve learned, but I also know that I need them. Rick was an example. Another is Daniel Barchi, who is at NewYork-Presbyterian now. We’ve known each other for a long time — when he was at Yale, and before that at Carillion Clinic. We’re meeting tonight to go run in Central Park. We met about a month ago, and we’re trying to get a cadence going of meeting on a regular basis, because iron sharpens iron. We learn from one another, and we share things like, ‘What do you about this?’ ‘This is a difficult decision. What do you do?’ ‘How do you handle the politics?’ He’s a great example. I also serve on the CHIME Boot Camp and I’m pretty tight with four or five of the other faculty members. When I’m in trouble — or ideally, before I get into trouble — I always have people I can reach out to and ask how they handle these certain complex situations. You’re only as strong as the people around you. If I try things on my own, I’d be pretty mediocre, but by extending my capabilities through others and by leveraging the things that they’ve learned, I make myself a lot stronger, and therefore, I provide a higher level of service for those who I work for. So it’s really important to have that network out there of people that you can draw on. Gamble: When you think back over the years, is there any advice you’ve received that has really resonated? Marx: I’ve made it a point to always have a formal mentor. Every even year, I have a formal mentor, and I’ve been doing this for about 24 years now, so I’ve had 12 or 13. When I say formal, it’s a contracted relationship. It’s one-year long, and it’s very structured. I keep this running list of what I call the golden nuggets of the top things I’ve learned, and every once in a while I review that list just to freshen my memory and remind myself of some of the important things I’ve learned. One piece that stands out is, ‘relationships cover a multitude of sins.’ It goes back to what we were talking about earlier in terms of relationships, because you’re going to make mistakes. If you have a good relationship with someone, they’re going to be pretty quick to forgive you and realize that, yes, you made a mistake, but that’s not who you are. You’re much more than just that mistake, because you’ve had other successes. That’s really important. Another one is it’s your presence, not your presents. I mean present as in, ‘I’m here in front of you,’ as opposed to presents you might receive at Christmastime. It’s really easy for us to give presents. It just costs us a little money. We give presents because it shows we care about you and think about you. That’s easy. What’s more meaningful is your presence. I’ve lived with that a long time. As a result, whenever I can, I make sure not to miss a funeral of anyone in my organization, their family’s wedding, bar mitzvahs, etc. Anything that was important that I’ve been invited to I’ve always made, because that speaks more than just giving a gift. And sometimes you can’t be there. I understand that. But I always believe in presence. That’s one way it manifests itself. Another way is to stop using email or hiding behind a phone, and be there. When there’s a difficult situation, it’s really important that you go there in person and they see you, because that speaks of volumes. I recall one time when I was at University Hospital in Cleveland and we had a legacy electronic health record that went down on what seemed like a routine basis. The ED director called me and he was shouting over the phone. I couldn’t get a word in to really say anything or respond. The ED of this particular hospital is about a 10-minute walk from my office, so I put down the phone and walked as quickly as I could over to the ED. I showed up in person, and his jaw dropped that an ‘executive’ would show up in person. Then I said, ‘I am so sorry. Show me how this impacts you.’ He walked me around and introduced me to the other doctors and administrators and just showed me what the impact is. The cool thing is that even though we couldn’t do much about this legacy EHR that was problematic except to replace it — which we did — he started telling that story over and over to other doctors and other service line directors. Before I knew it, I was hearing back from the CEO of the hospital and the CEO of our health system where they were telling me back the story. They said, ‘Marx, that’s pretty cool. I heard from Dr. Michaelson that you went over there and that it really had an impact.’ When you do this multiple times, it does become part of the brand of who you are. People think, that person cares. That CIO cares, because he or she is not sitting up in their ivory tower. They’re actually coming down and talking to me. They’re listening to me and physically walking through my environment. There was another story that happened similarly where the Director of Service for our NICU had the same experience where some of the technology that we provided her and her team was really subpar, and it didn’t get taken care of like I had thought it had. She called me and it was the same thing. I said, ‘Give me a couple of minutes. I’ll be right over.’ I went over there, and sure enough, I saw these lines of five or five residents standing at one or two devices that were working, while six or seven of our WOWs were in the hallway with something wrong with them, and she just cried. I hugged her, and I cried with her. I didn’t know what to do except to commiserate and say, ‘Oh my gosh, I’m so sorry.’ Then we took care of it immediately, and I set some other things in motion so that those situations wouldn’t happen again while I was in charge. That’s what I’m talking about when I say presence, not presents.